I'm reviewing my wardrobe and one of the things I've done is to evaluate each item in the 40 piece minimalist wardrobe which I chose in August 2014. For background information, I came to creating an all season minimalist wardrobe after several rounds of Project 333. Despite a lot of thought going into this wardrobe, few of the original pieces remain: many items were hardly worn, and were therefore donated, and several wore out. However, I'm pleased to say that some are still going strong! Losing a few pounds due to changing to a lower carb diet last year, meant that some items just don't fit anymore. I think it's really interesting to reflect on how many of the selected items of clothes have been worn over the last three years and I've used this knowledge to help me with future garment purchases and decluttering. I would like to say that my wardrobe has stayed constant at 40 items, but the truth is that I haven't been disciplined enough to maintain it. I've bought some lovely new pieces recently and my wardrobe is beginning to bulge. I'm beginning to feel wardrobe overwhelm again and I'm definitely holding onto clothes which I hardly wear. Hence, the need for a thorough review, edit and wardrobe revamp. I'm aiming at 40 pieces again or thereabouts. I like my wardrobe to be tidy and organised and 40 items fit nicely into the space I've got, but I think some seasonally specific items (such as boots, thick jumpers and summer dresses) may need to be put in storage. Less than 40 clothing items is too drastic for me but I would like to try the 10 x 10 Challenge as I'm interested in seeing what an extreme minimalist wardrobe could teach me and how it could influence me in the future. It may help me get back to close to 40 items. A clothes shopping ban is also something I'm interested in trying. 1. 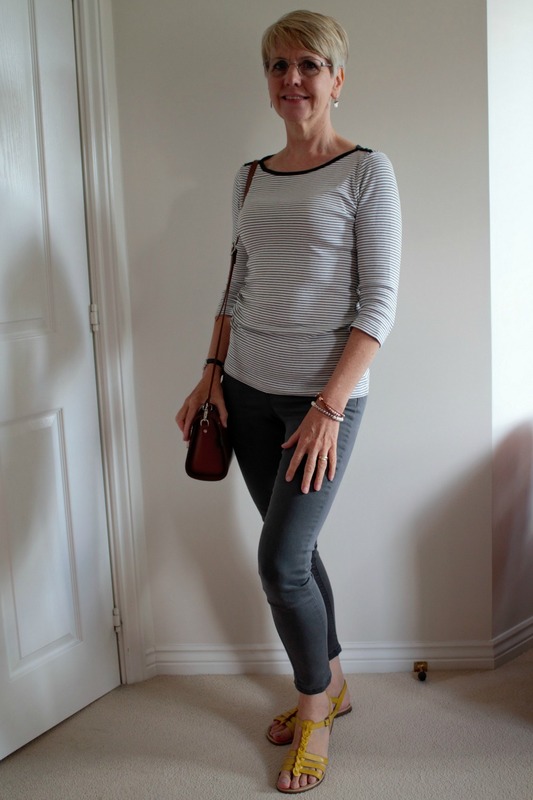 Blue skinny jeans (M&S) - donated as too baggy but replaced with similar better fitting version which I love. 2. Blue bootcut jeans (Next) - almost worn out (need patching!) but still used for gardening. 3. Black work trousers(Next) - donated as a duplicate to item 4, and not worn enough. 4. Black smart trousers (Principles by John Rocha) - still in good condition. 5. Black linen trousers (F&F) - kept but only wear in hotter weather and mainly for work . 6. Black jeggings (M&S) - faded but replaced with grey pair (as seen in photo). 7. Black/grey linen skirt (M&S) - donated as didn't wear enough. 8. Tulip skirt (Laura Ashley) - donated as not versatile enough. 9. Pink velour skirt (Seasalt) - kept as still wear a lot although slightly loose but this doesn't matter as it just rests lower on my hips. I've seen this exact skirt on Ebay but I'm going to keep mine as long as it lasts! 10. Green cotton summer dress (Laura Ashley) - donated as hardly worn. 11. White v-neck t-shirt (Boden) - recycled as holes formed, which disappointed me given the label. 12. Grey v-neck t-shirt (Boden) - recycled as holes formed, which disappointed me given the label. 13. Black v-neck t-shirt (Boden) - wear for cleaning as holes formed which disappointed me given the label. 14. Blue modal light blue round neck t-shirt (Gok for TU) - recycled as lost shape but it had a lot of wear. 15. Purple draped t-shirt (Laura Ashley) - donated as not versatile enough. 16. White/black stripe 3/4 length sleeved top (Gap) - kept in fact wearing in photo above (although would prefer full-length sleeve). 17. Black/white stripe 3/4 length sleeved top (Gap) - kept (although would prefer full-length sleeve). 18. Coral sequin 3/4 length top (M&S) - donated as tired of the colour and the sequins. 19. Navy smart blouse (M&S) - donated as didn't like neckline (too low). 20. Purple linen grandad shirt (Wallis) - donated as didn't wear enough. 21. Check blue/green check casual shirt (F&F) - donated as didn't wear enough. 23. Blue round neck long sleeved top with cuff detail (M&S) - recycled as holes developed. 24. Light blue round neck long sleeved top (M&S) - kept as still in good condition and light but warm. 25. Green striped woollen tunic (Seasalt) - kept although beginning to wear out. 26. Grey cashmere cardigan (F&F) - kept as versatile, wear weekly and still in good condition. 28. Black boyfriend cardigan (M&S) - donated as didn't wear enough. 29. Black blazer (F&F) - donated as condition deteriorated. 30. Black biker jacket (M&S) - donated as started to disintegrate. 31. Purple gilet (Gap) - kept as versatile, wear regularly and still in good condition. 32. Blue storm coat (Berghaus) - wear regularly but needs replacing as lining disintegrating. 33. Purple parka (M&S) - wear constantly October -April but wearing out and tiring of this so would like to replace eventually. 35. Black and cream ballet flats (Debenhams) - recycled as worn out. 36. Flat sandals (local boutique) - recycled as worn out. These yellow ones in the photo above have replaced them (I like splashes of colour in my outfits). 37. Black small heeled brogues (Rieker) - kept as still wearing reguarly (great for work). 38. Brown Chelsea boot (Next) - donated as found a black ankle boot more versatile. 39. Purple patent Birkinstocks - recycled as worn out. 40. Black tapered heel ankle boot (M&S) - kept for occasional use but I don't feel comfortable in heels anymore. Paring down my wardrobe to 40 pieces has taught me a lot. Putting one together is easy; it's the discipline to keep it from growing that's difficult. However, I'm keen to try again. I'm aiming at a small wardrobe which is just enough to suit my lifestyle, love of clothes and is easy to organise. Have you tried any minimalist wardrobe challenges? What works for you? Is clothes shopping your weakness? Please share, I'd love to hear from you. That's a lovely photo of you Claire. You look so slim and your new hair suits you a lot. I also have your sandals - I didn't need them but they were in the sale and I loved the colour. My wardrobe's a work in constant progress. I can't seem to get the balance quite right - I have lots more tops than bottoms, etc, etc. We're off on holiday to Mevagissey at the weekend and my suit case will contain lots - only half of which I'll probably wear! (I might even be tempted to purchase another pair of bright sandals whilst I'm in Cornwall whilst they're in the sale!!). I too have done a few rounds of P333, but I've really let things slip just recently and all the clothes that should be packed away have crept into my wardrobe space, making it feel cluttered and annoying. Perhaps like you I will up the number to maybe forty or even fifty and make it a year round thing, have a really good sort out and sell or donate everything else. I admire the idea enormously but haven’t got there yet. I’ve operated a ‘one in one out’ policy for a few years. This helps focus the mind in shops. If I see something I really want I have to ask myself what will go if I buy it. if I can’t answer that question then the item can’t come home. I don’t need it or want it enough and even if I’ve tried it on and like it if it isn’t going to replace something it isn’t for me. Love the blog thank you. Your hair looks lovely Claire (it looked lovely before too!) and is probably easier to look after. I mention this because I made a decision in early June that I would no longer blow dry my hair but rather embrace my natural waves and that has simplified my life no end.The condition of my hair has improved, too. Are you still doing no poo? I went on a shopping fast for 4 months and my wardrobe now contains all the clothes I own but I haven't counted them yet as I'm still culling on a regular basis. Wouldn't it be wonderful if we knew which clothes would last well and fit properly before we bought them?